Choosing a gift for a grandparent is often easier said than done. After all, Grandma and Grandpa may already have a lifetime's accumulation of "stuff," so you may have to use a little imagination to come up with a terrific gift. If you are drawing a blank? Spark some inspiration through exploring gift ideas for grandparents. Finding a perfect gift for someone who has everything can be difficult. 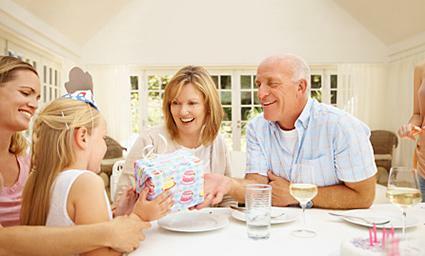 Explore unique gift ideas to find the perfect way to celebrate your grandparents. A night on the town, a museum trek, or even a couple of hours at the latest movie would each make a wonderful gift for a grandparent. You can tailor these kinds of gifts to fit almost any budget, especially when you take advantage of senior discounts, which are available for many entertainment options. Buy a couple of movie matinee tickets or a senior pass for unlimited admission to a local museum. Purchase a special "senior" season pass to a theater playhouses or music hall. This allows the recipient to attend the performance of his or her choice. Buy tickets to a sporting event. Even if the seats are in the nosebleed section, attending a game can be much more fun than watching a favorite team on TV. Keep in mind also that some seniors prefer not to drive at night, so an evening out is more special when you're a companion and chauffeur. Everyone likes to share their enthusiasm for their interests. Asking your grandfather to help you with a woodworking project or going bird watching with your grandmother is a cost-effective gift with high value. Grandparents who collect particular items make shopping fun. Setting aside time to go on a treasure hunt can be quite entertaining. As an alternative, you might offer to help catalog the pieces by creating a computer file with particular details. You can also surprise a grandparent by adding to the collection, but check around first to see what he or she looks for, or why the addition would matter. Senior budgets are sometimes tight, so buying your grandparents some supplies for their hobbies can make a wonderful gift. 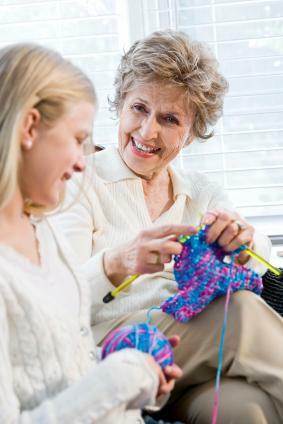 If your grandparent likes to knit or crochet, consider buying some yarn and a pattern for a project. If he or she loves to paint, purchase some new canvasses, and perhaps a fresh set of oil paints and various brushes. If you know your grandparents have been talking about trying something new, give them an experience gift. Whether it's a paint-your-own-pottery session or skydiving lessons, you're helping them open up their world. A trip doesn't have to be a two-week cruise, but that's certainly one option. Sometimes just a day trip to a special event or to a grandparent's hometown makes a great gift. Set aside time to plan the excursion together. By planning together, you create anticipation that will enhance the overall experience. This might not seem like the typical gift you'd give a grandparent, but it really can be great. Everyone loves the chance to feel refreshed and renewed. Just make the spa staff aware of your grandparent's physical capabilities before the visit, and they'll help you choose the treatments that best suit his or her needs. Encourage your grandparents to become the family historians by asking them to help put together a scrapbook and record family stories. You can purchase new photo albums and fun scrapbook materials almost anywhere. Set aside a few Saturday afternoons to help your grandparents go through mementos, photos, and other trinkets of the past, and then help put them together in a new way. Use an inexpensive cassette recorder to record some of the stories they recall from childhood, early days of marriage, and tales about other family members. Next, make copies for other members of the family. You might be surprised by just how fascinating others find these memories, and you've also captured important information for future generations to enjoy. Some people take to computers, cell phones, digital cameras, and other forms of technology quite readily. Others need a little assistance. Many community and senior centers offer classes, but with patience and humor, family members can enjoy spending time together while learning something new. For example, a grandson who is a whiz at cell phones can help Grandma program phone numbers and download a funny ringtone or two. A college-aged granddaughter can show Grandpa how to set up a Snapfish photo account to share family photos. Make a simple gift certificate that states, "In exchange for computer services, Grandpa will teach me (insert topic here)." Many grandparents delight in the opportunity to pass along their knowledge to other family members. Other good gifts for grandparents, especially those on a fixed income, are cash or a gift card to their favorite store or restaurant. You can even take them shopping. Cushion this kind of gift with sensitivity, humor, and respect so the recipient isn't insulted. Encourage your grandparents to treat themselves, or set the money or cards aside for a special day out. Don't make it seem as if they can't afford to do certain things or can't take care of themselves. While cash and gift cards may seem impersonal to some, the intent is that the recipient can spend it however he or she wishes. The most dazzling gift for grandparents is the gift of your time, and there are many ways you can spend quality time together. Arrange for a once-a-month lunch date. Involve yourself in their interests. Let them share stories of "when they were your age." Ask for their perspective on past world events, or how technological advances have affected them. Whatever kind of gifts you choose to give your grandparents, however much they cost, don't choose completely impersonal gifts that don't take much thought to pick out. Make sure your gifts always suit them in some important way that shows just how much you care.